The crews of the International Space Station (Expedition 26) and the shuttle Discovery (STS-133) pose for a photo inside the newly attached Leonardo storage module, known as the Permanent Multipurpose Module, on March 1, 2011. They are (clockwise from the lower left) NASA astronauts Scott Kelly,; STS-133 mission specialists Alvin Drew, Steve Bowen, Nicole Stott; Russian cosmonauts Oleg Skripochka and Alexander Kaleri, NASA astronaut Cady Coleman, Russian cosmonaut Dmitry Kondratyev , STS-133 commander Steve Lindsey; European Space Agency astronaut Paolo Nespoli; STS-133 pilot Eric Boe; and mission specialists Michael Barratt. This story was updated at 4:14 p.m. ET. HOUSTON– After a busy couple of spacewalking days at the International Space Station, the astronaut crew of NASA's shuttle Discovery is taking some well-deserved time off today (March 3). And they'll need the rest: NASA has added another day to their already extended mission. Discovery launched on its final mission, STS-133, on Feb. 24 and arrived the orbiting outpost two days later. Since arriving, the 12 astronauts on Discovery and the space station have had very little down time as they work to prepare the station for the years ahead after NASA's space shuttle program ends later this year. "So far the mission has been fantastic," shuttle commander Steve Lindsey told reporters in a televised interview. "We've accomplished most of our major objectives already. We're looking forward to a couple more days on this beautiful International Space Station." Earlier in the flight, mission managers extended Discovery's flight by to give astronauts more time to work on a new storage room the shuttle crew delivered. Flight planners decided today to add one more extra day for the same reason, NASA officials said. Discovery will now land at the Kennedy Space Center in Florida on March 9 at 11:48 a.m. EST (1658 GMT) after a total of 13 days in space. By coincidence, the flight is also Discovery's 13th trip to the space station. Discovery has flown 39 times in since its first launch in 1984. The shuttle crew has installed a storage pallet on the station's exterior, completed two spacewalks to upgrade parts of the space station, and attached a new storage module – the last NASA addition to the station's assembly – to the bottom of the U.S. Harmony node. Today, the astronauts got an early start, with a wakeup call at 5:05 a.m. EST (1005 GMT). Mission Control roused the crew with the song "City of Blinding Lights" by U2. Later today, they are expecting a special call from President Barack Obama at 5:03 p.m. EST (2203 GMT). The president will speak to the astronauts as they orbit 226 miles (363 kilometers) above Earth. The cosmic wakeup call song this morning was originally chosen for astronaut Tim Kopra, who was originally assigned to Discovery's mission, but was replaced in January after he suffered a bicycle injury. Kopra, who remains involved with the mission here on the ground, dedicated the song to the entire crew. Discovery's crew will spend the morning moving cargo out of the newly-installed storage module, which was packed with about 6,500 pounds (over 2,900 kilograms) of supplies and hardware for Discovery's final journey to the space station. The astronauts will then have the afternoon off to relax and soak in the experience of being on the space station – in what is the last time they will have traveled there aboard a shuttle. "There is just nothing that compares when you look back at the Earth, regardless of where it is," said mission specialist Nicole Stott. "You can't describe it, and unfortunately pictures just don't capture it." 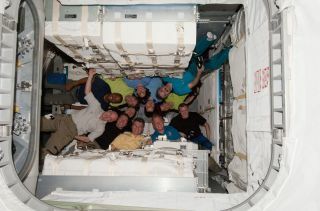 The crew of Discovery's final mission delivered the new storage room and Robonaut 2 to the International Space Station. The shuttle is now due to undock from the orbiting laboratory on Monday (March 7) and land Wednesday (March 9) at NASA's Florida spaceport. This is the final flight of Discovery before NASA retires its space shuttle fleet after 30 years of service later this year. Only two more shuttle missions, aboard Endeavour and Atlantis, are planned. "There's a word used a lot, and it's 'bittersweet,'" Stott said. "We have to look at the positive side of this – the celebration we need to have of the success of Discovery as a high-performing spacecraft. Discovery has done so many things. It's just a part of history that I hope we hold onto and appreciate, and that we celebrate when we get home and are walking away from her on the runway for the last time."